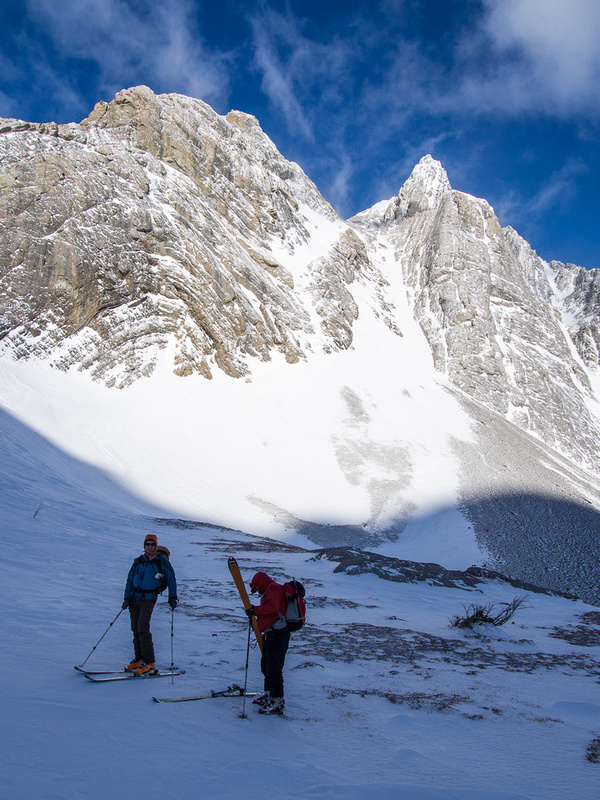 On this particular Saturday morning it was three of us leaving the parking area alongside the Spray Lakes road; Bill, Wietse and myself. The morning was considerably warmer than the week previous and the weather promised to be clearer as well. From Pig’s Back a week earlier, Smutwood became pretty socked in by early afternoon since it sits right on the divide. We hoped for some great views from its summit. We had no incidents on the ski into the Smuts meadows and up Commonwealth Creek. 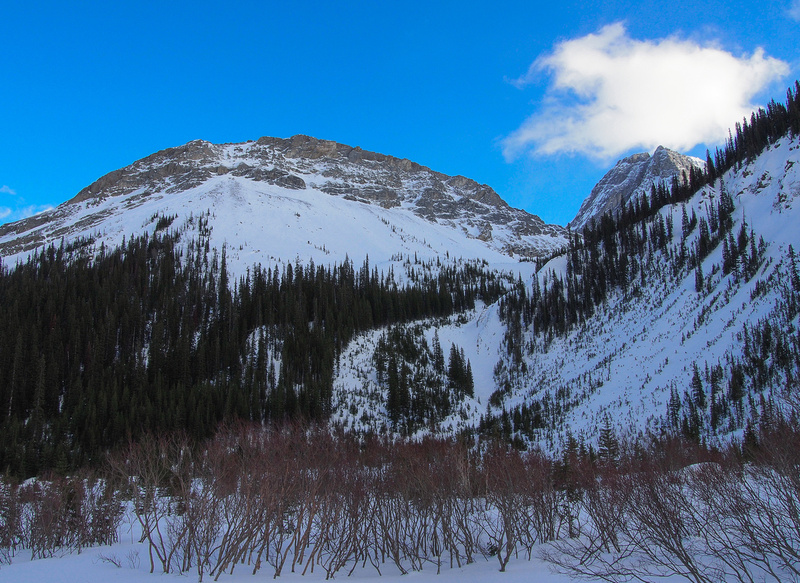 Wietse broke trail alongside the creek and up to the towering NE face of Mount Birdwood. 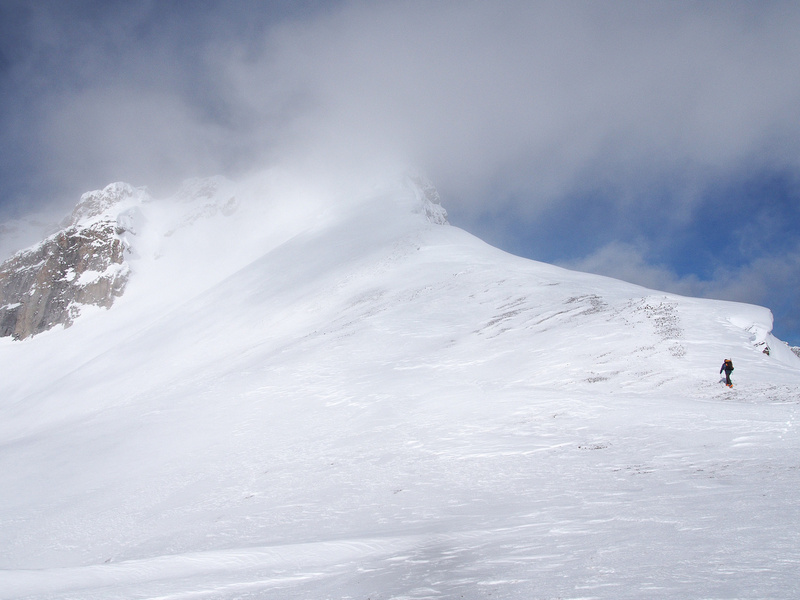 There was some evidence of sloughing off the face (probably cornice failure) and high winds looked to be blasting the summit but we forged ahead – conditions seemed pretty tight. Wietse led the way up the hard packed snow at the end of the Smuts Valley to climber’s right and up towards Smuts Pass. 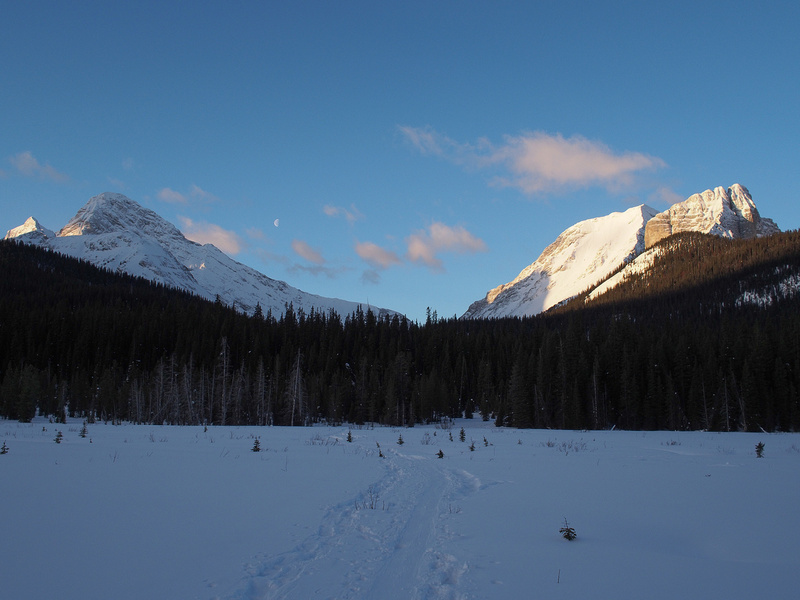 Starting our day from the Spray Lakes road skinning up Commonwealth Creek towards Smuts Pass with The Fist and Smuts at right and Birdwood at left. Once we were at the scrambler’s turn off for Mount Smuts we had to take the skis off temporarily before skiing a bit higher to the top of the pass. From there we had excellent views of Smutwood and the very skiable terrain around the two Birdwood Lakes which were obviously buried in many feet of fresh powder. 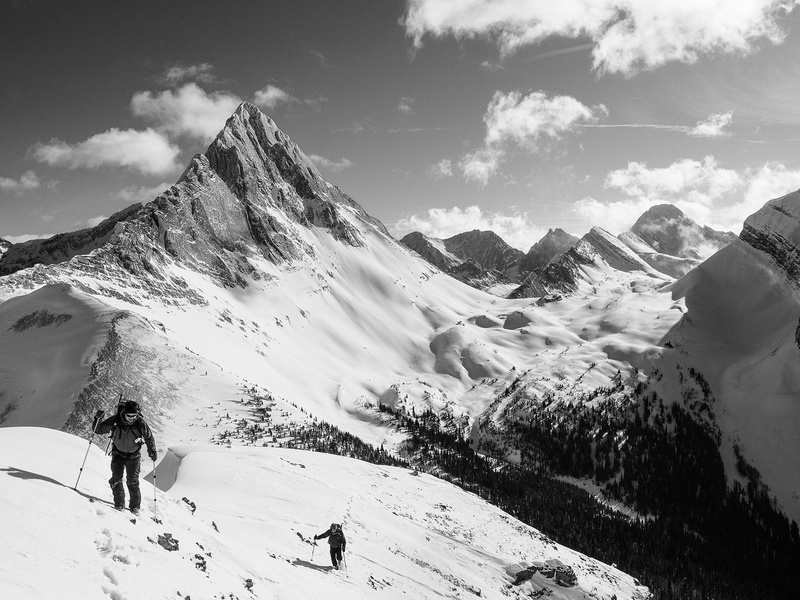 It was hard not to simply break trail into that bowl and start making turns. I’ll be back there for sure to do just that! 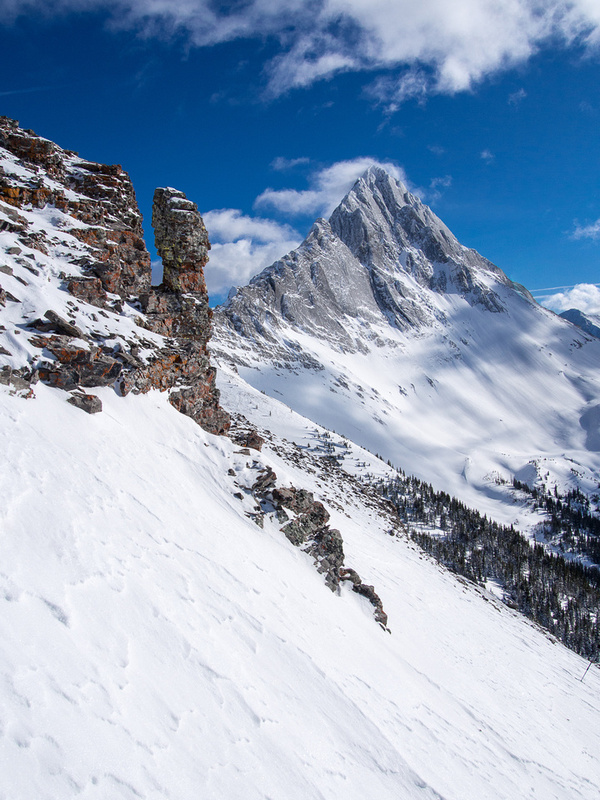 It even looked very possible to ski right into the bowl from between the false and true summit of Smutwood which would be rather cool. 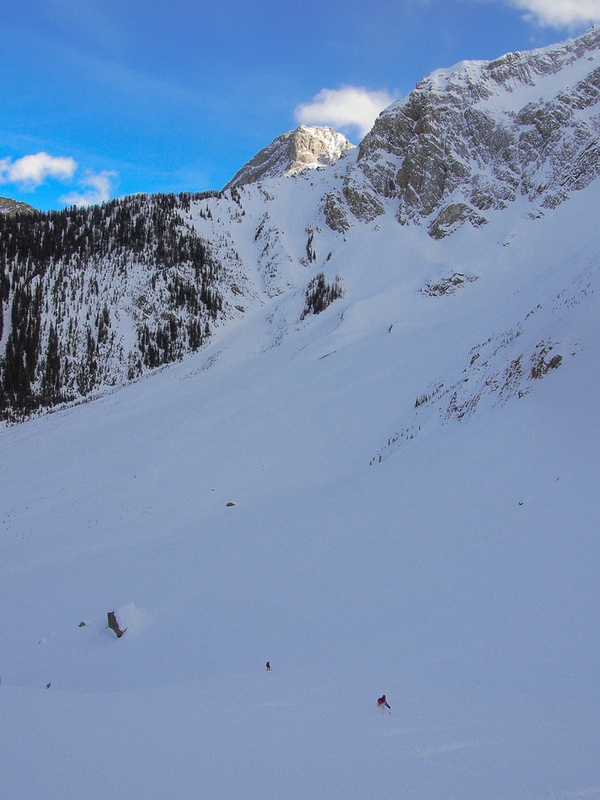 Bill ascends steep snow slopes under Smuts Pass with The Fist peaking out on the right. Wietse and Bill putting the skis back on beneath towering Mount Smuts after taking them off briefly to cross some wind blasted scree slopes. 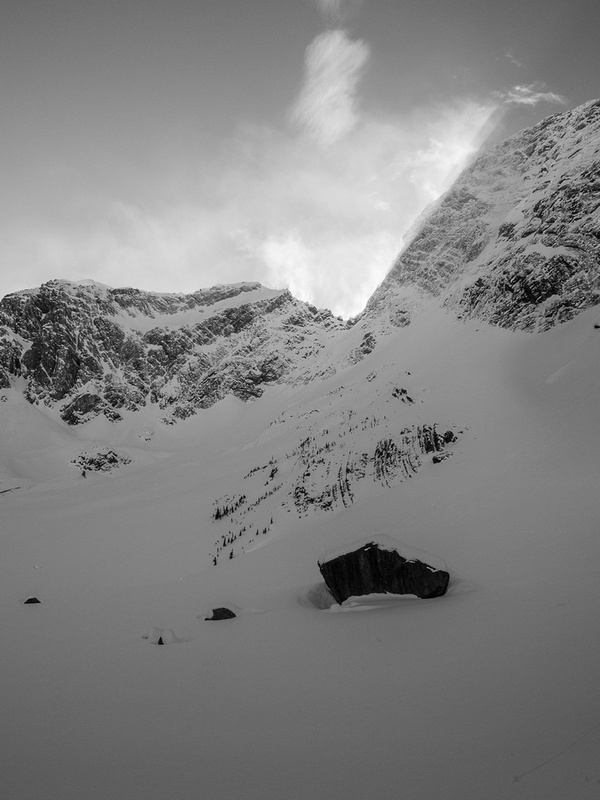 The scramble route for Smuts goes up the obvious gully and then traverses onto the scary looking rib on climber’s right. Wietse again broke trail on the supportive snow pack to the col between Smutwood and Birdwood. 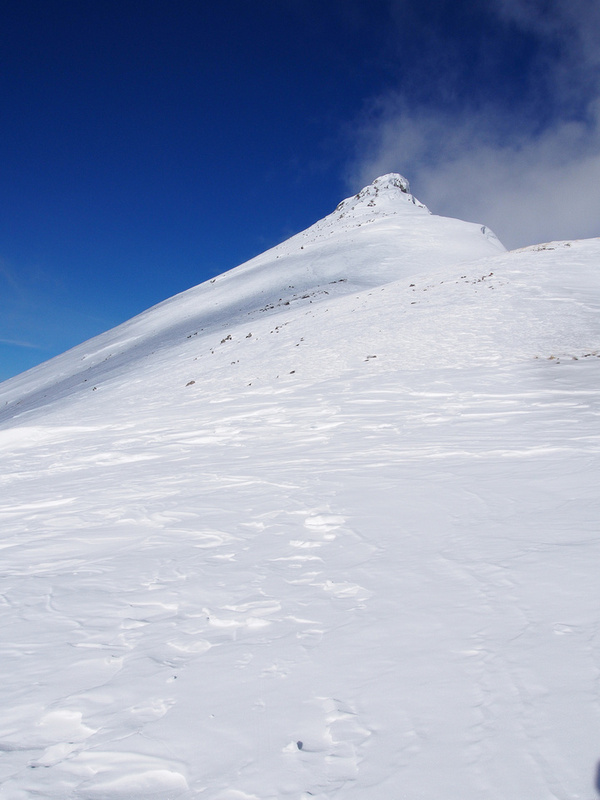 From this col we skied towards the long ridge leading up to the false summit. 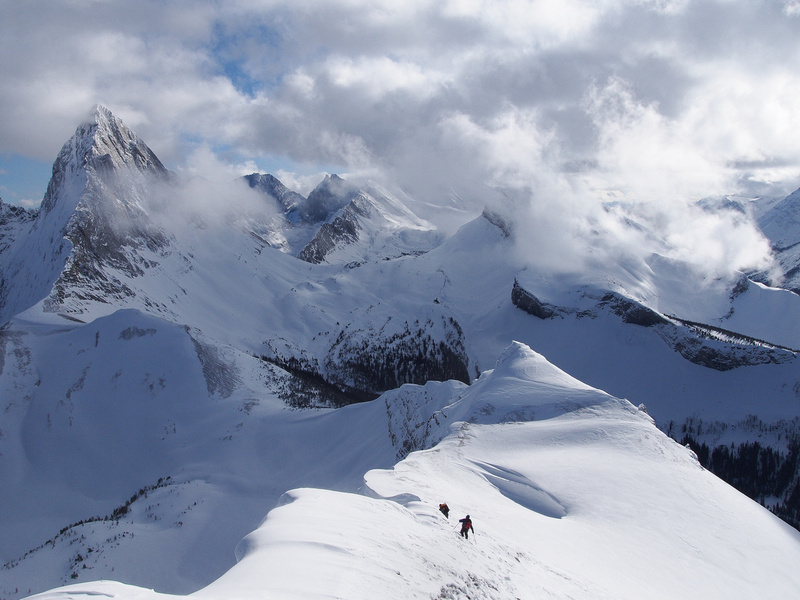 Before getting too far up the right we stopped for lunch to some jaw-dropping views of Mount Birdwood and Snow Peak over near Burstall Pass. 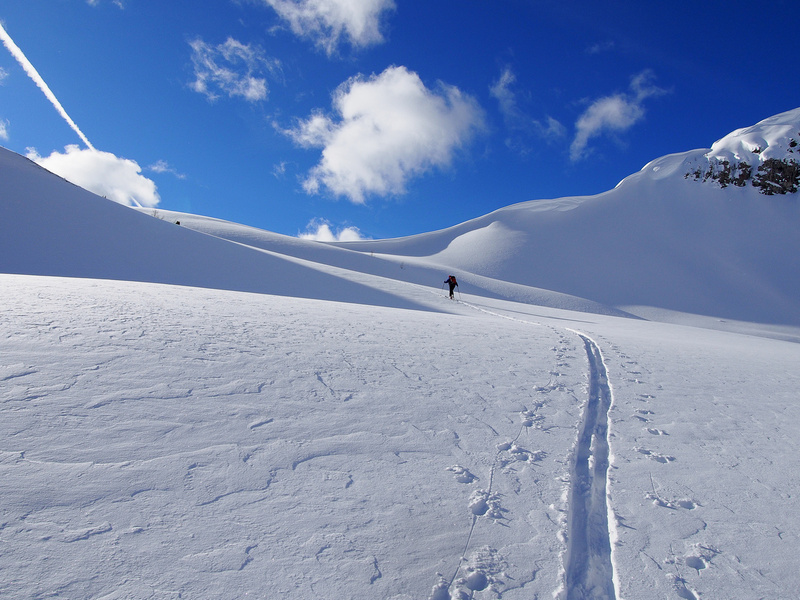 Some low cloud mixed with brilliant sunshine added to the winter drama – totally worth doing this trip on skis. Wietse is a speck in the far distance. 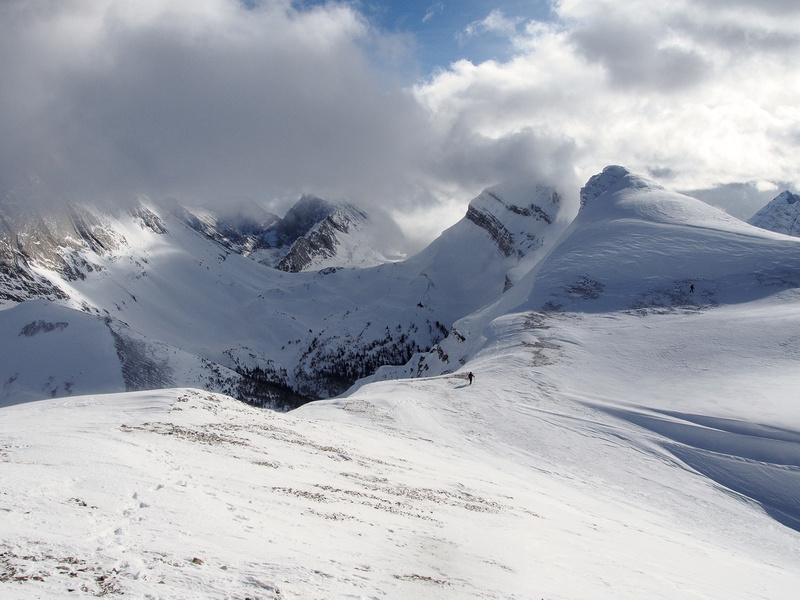 Smutwood’s two summits (main on right) and Smuts on the far right. Look at all that FRESH POW. After a delicious lunch we started back up the ridge. 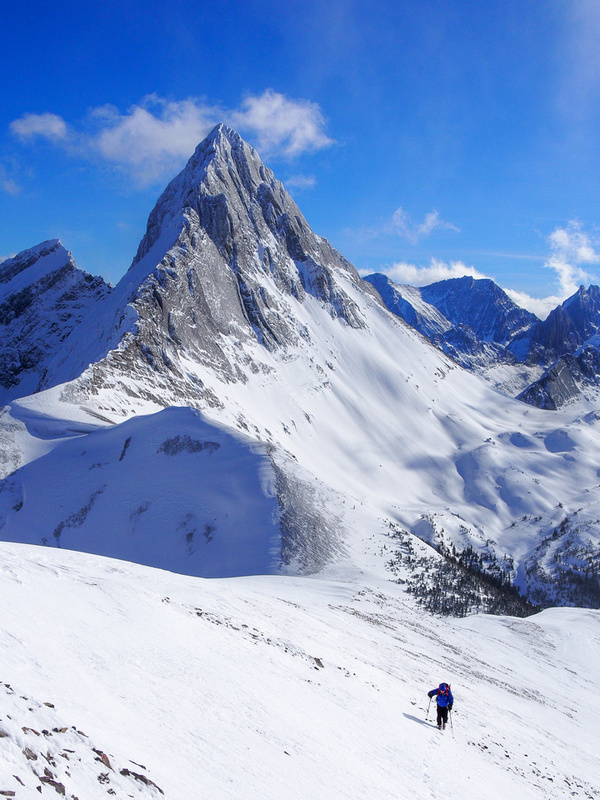 We didn’t get far up the ridge before we had to drop the skis and proceed on foot. 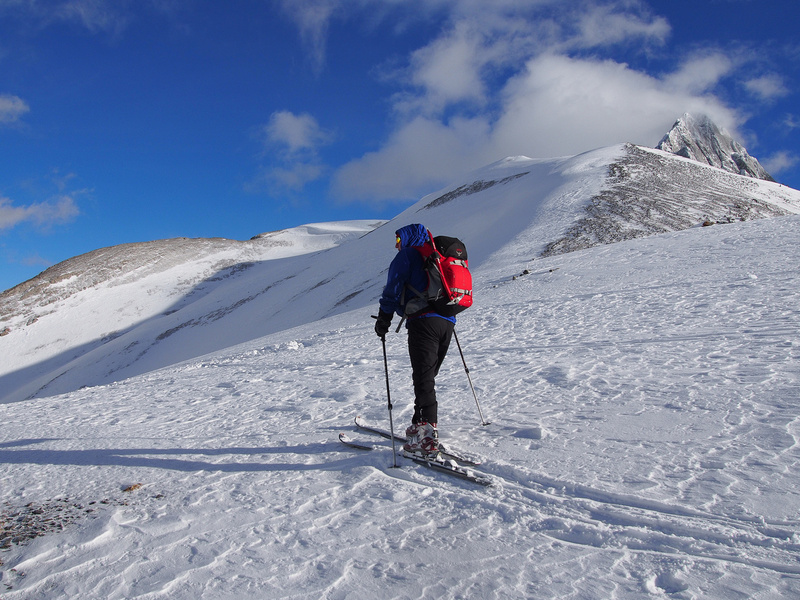 The snow on the west side of the ridge varied from packed (which was great) to mostly sugary, unsupportive crud. Thank goodness it wasn’t too deep or we would’ve been really working to get up the ridge. The views were amazing as we progressed higher and higher. I broke trail around the west side of the false summit. Looking back at Mount Birdwood and Snow Peak from the lower ascent slopes on the summit ridge of Smutwood. Bill comes over the col between the false summit and the true one. Birdwood looks awesome from this angle. 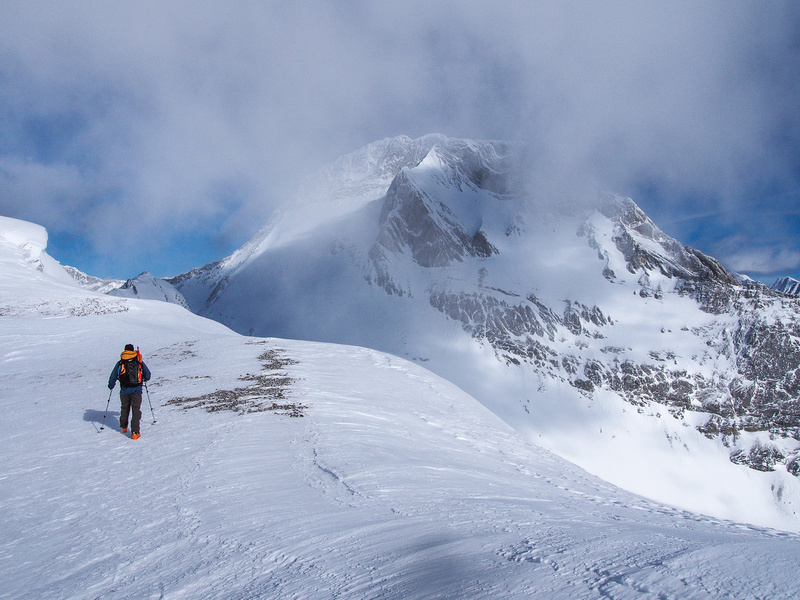 Wietse breaks trail for a bit – we’re getting closer to the summit but not there yet! 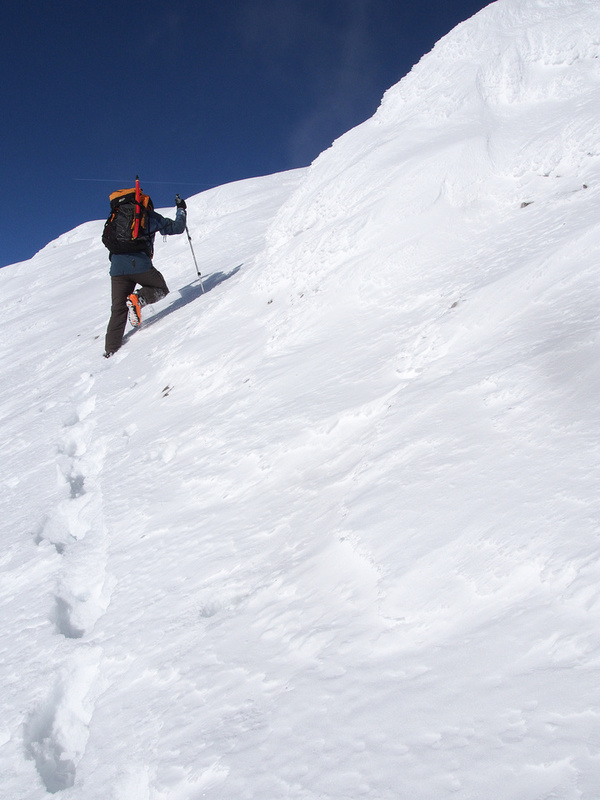 We also have to watch out for large cornices on our right. Bill follows us up the ridge. This section reminded me of the summit ridge on Balfour. Mount Smuts at left and Birdwood at center from the summit. We came over the pass between them on lower center. Looking over the Spray River Valley at Leval and Vavasour at left and Mount Leman at center. Snow Peak at left. The first head-on views of the true summit were a bit intimidating as we went down to the col between the false and true summits. It looked like a full-on climb but as with most climbs, once we poked our noses in it, the slope was pretty tame right up to the summit. After too short a time on the summit we started down again. 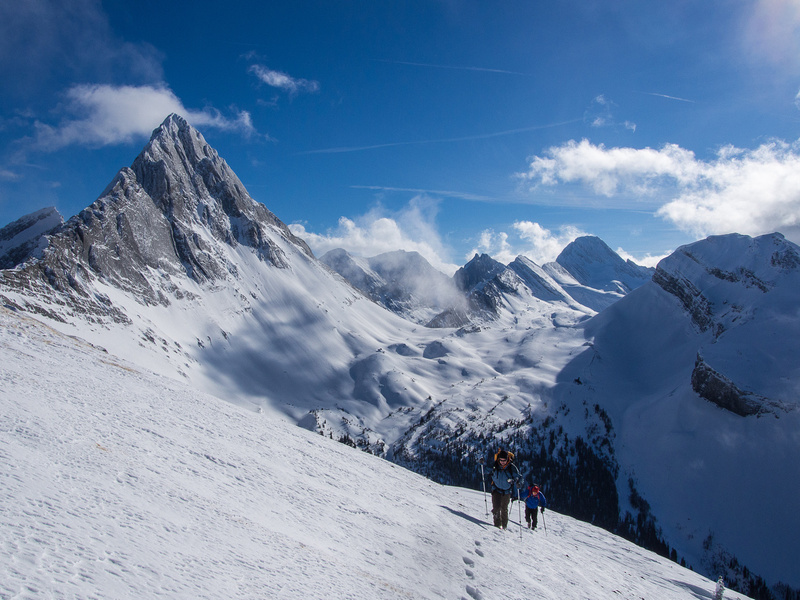 I took my time on the descent – the views were so gorgeous and the weather was so nice I didn’t want to rush too much. 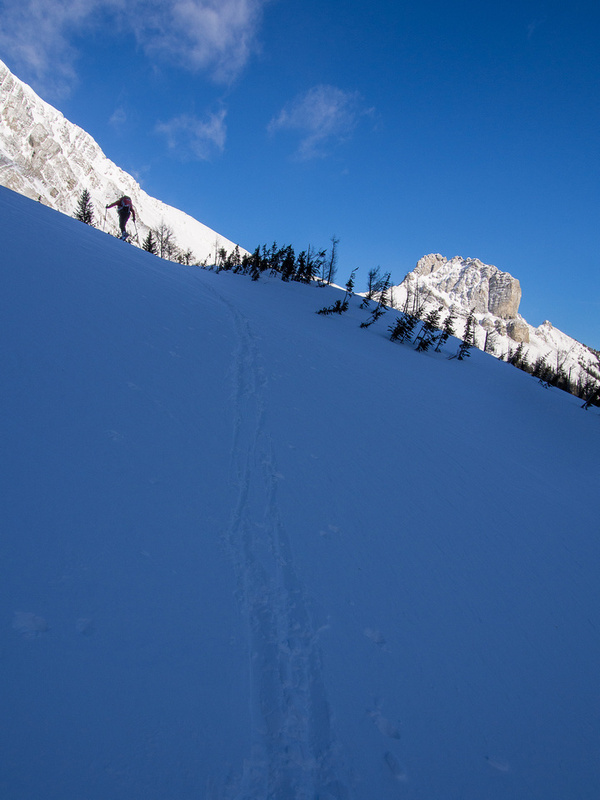 We had no incidents getting down to Smuts Pass and then descending slabby crud snow to the bottom of Smuts Valley before heading out on a great ski track to the vehicle. Mount Birdwood and Snow Peak provide stunning views as we descend to Smuts Pass which is out of sight at lower left here. 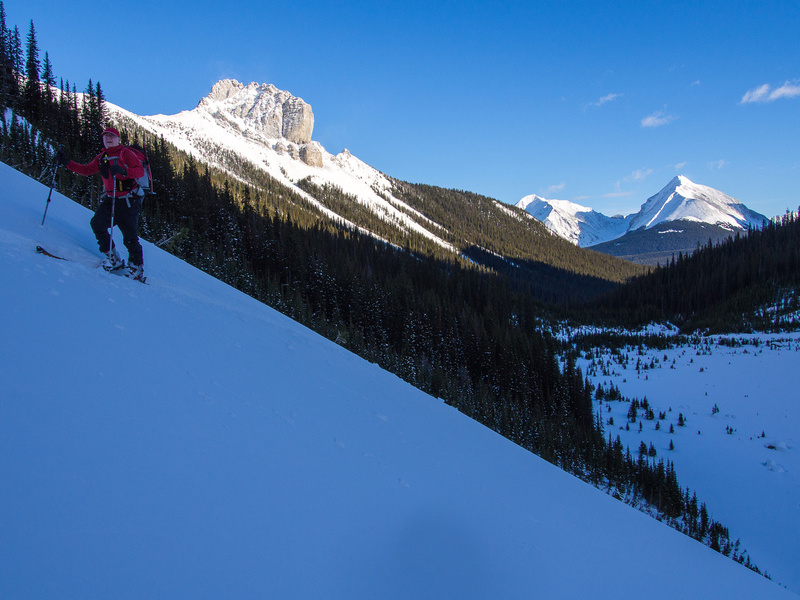 Bill skis down from Smuts Pass. The descent route from Pigs Back rises above him across the valley. 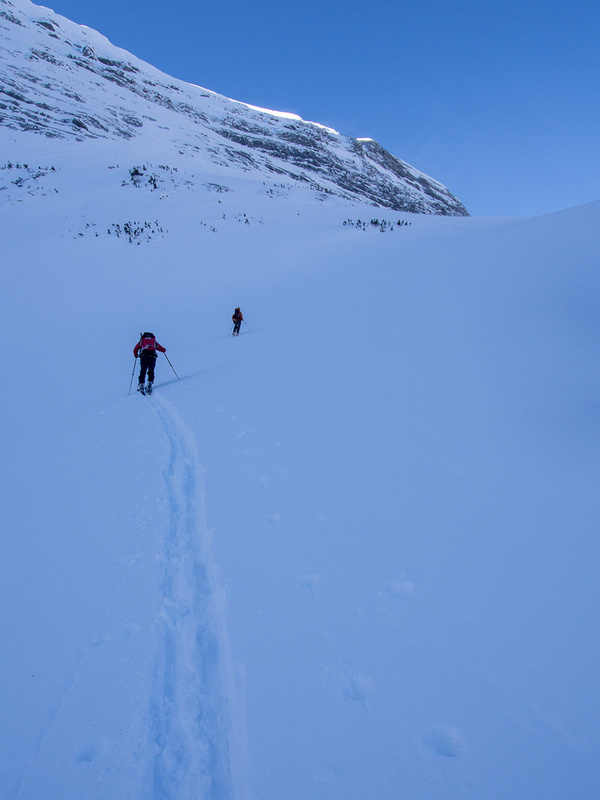 Our round trip time of 7 hours included some nice breaks and should be easily attainable for most parties with decent snow conditions. 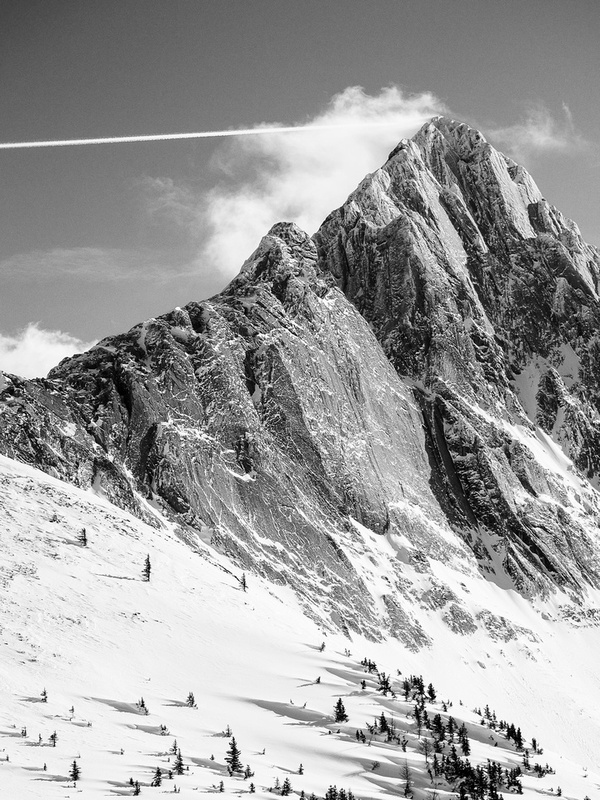 I very highly recommend this trip on skis – just make sure the avy conditions are low because you will find yourself on more than one tricky slope before the end of the day. 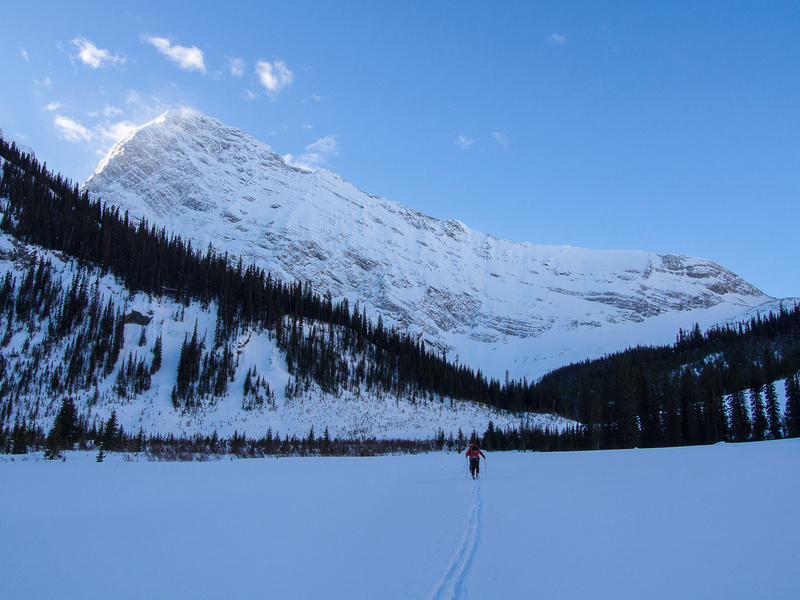 Starting our day from the Spray Lakes road skinning up Commonwealth Creek. 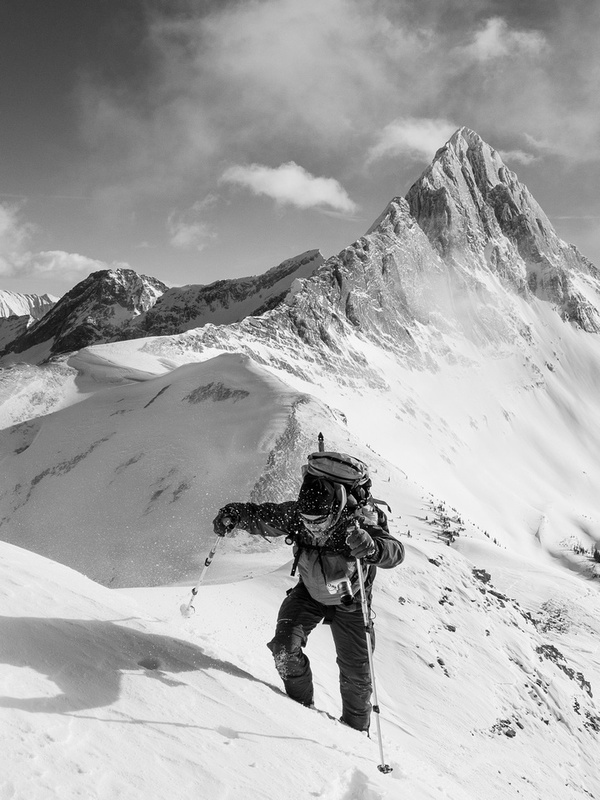 High winds look to be blasting Mount Birdwood's summit as we ski across the Commonwealth Creek flats below The Fist and Mount Smuts. Interesting shadows off the summit of Mount Birdwood. Looking back down Commonwealth Creek - The Fist at left. 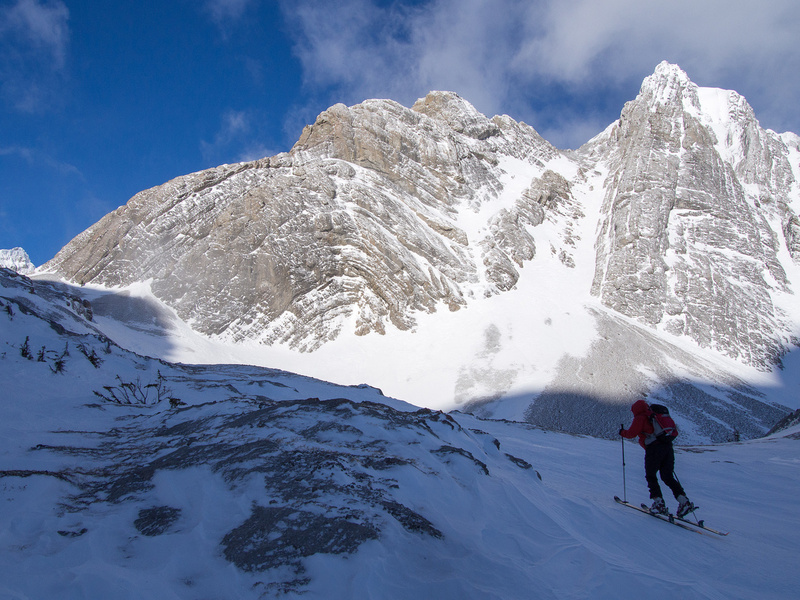 Working our way up the steep avy slope beneath the towering NE face of Birdwood. Bill with The Fist peaking out on the right. Wietse and Bill putting the skis back on beneath towering Mount Smuts after taking them off briefly to cross some wind blasted scree slopes. Wietse and Bill make their way up to Smuts Pass. Wietse is a speck in the far distance. Smutwood's two summits (main on right) and Smuts on the far right. Look at all that FRESH POW. Almost at the pass between Birdwood and Smutwood. Looking back at our tracks coming from Smuts Pass. Mount Smuts on the right. It looks like the plane crashed right into the summit of Birdwood! 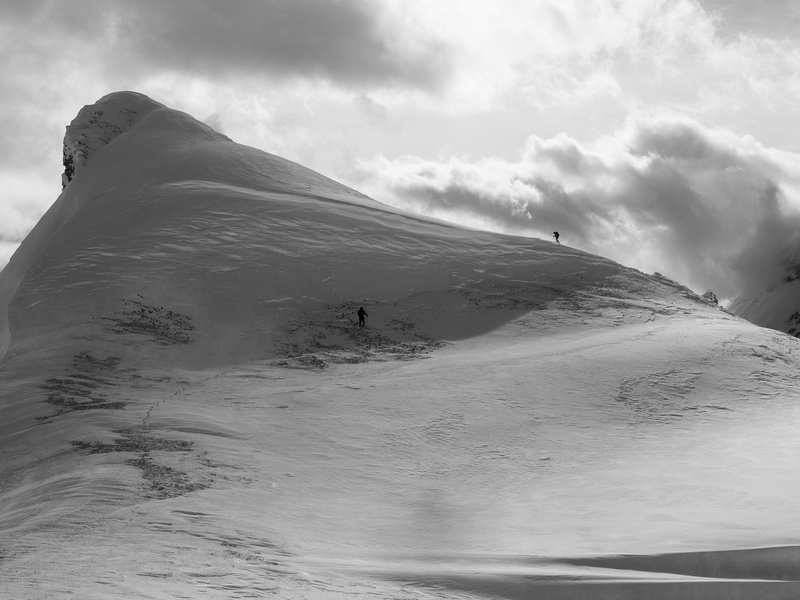 Wietse and Bill coming up the ridge. Apparently there's a ski tour that comes up from Birdwood Pass behind us and comes over the Smutwood / Birdwood col and then down our ascent route. 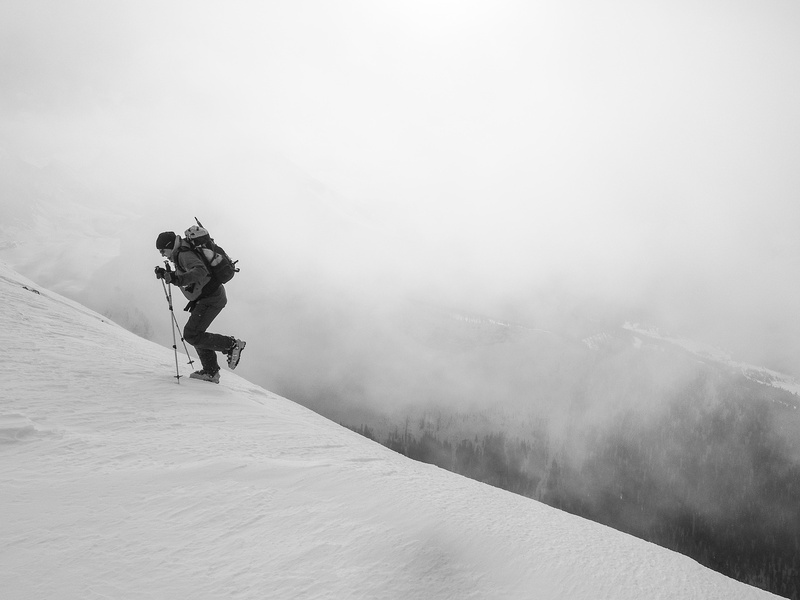 Wietse comes up a bump in the ridge as we're enveloped in clouds. Wietse breaks trail for a bit - we're getting closer to the summit but not there yet! 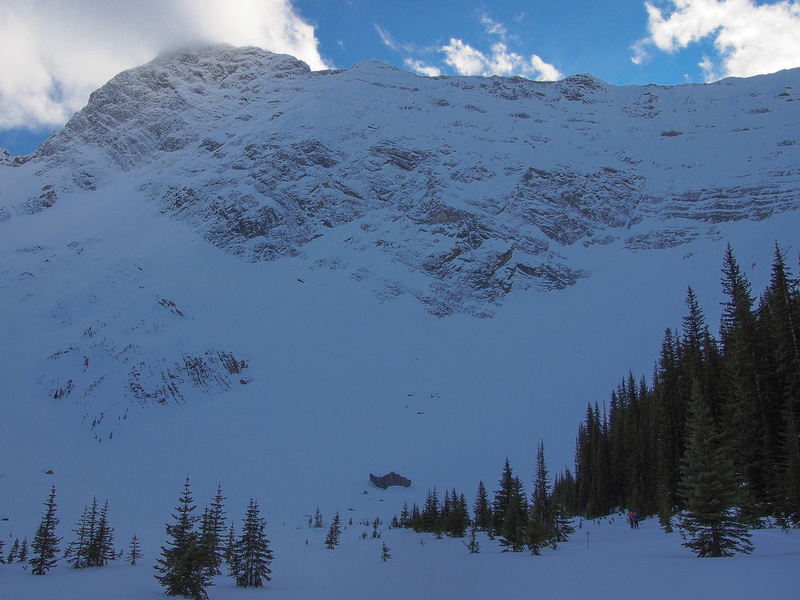 We also have to watch out for large cornices on our right. Pano looking west over to Mounts Warre, Vavasour and Leval. Getting higher. The weather is sublime. Feels like spring! 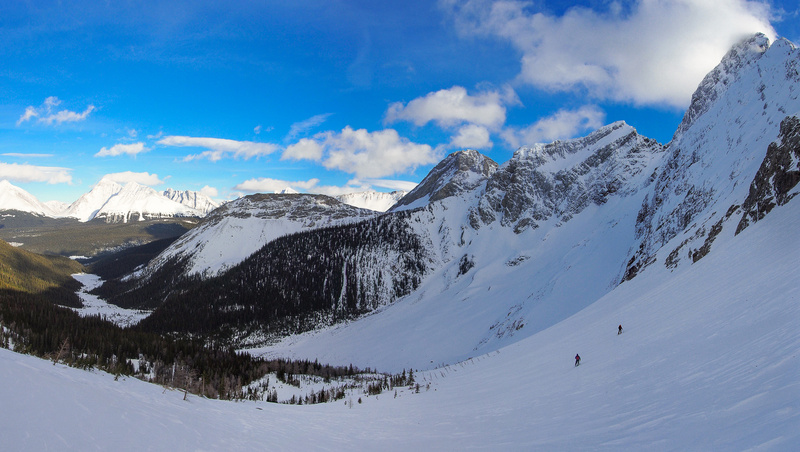 Pano looking north over the summit cornice towards Banff. Vern on the summit of Smutwood Peak. 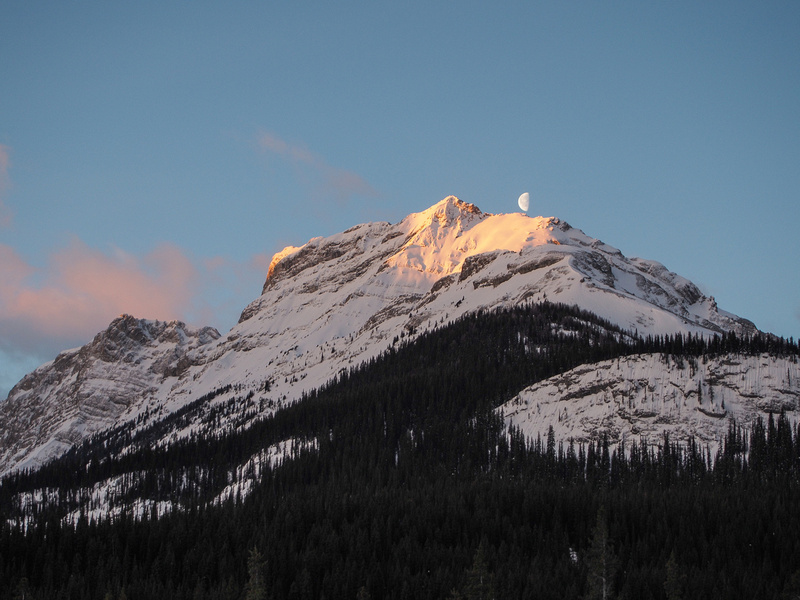 Summits include Birdwood, Snow Peak, Sir Douglas, Leval, Vavasour, Warre, Currie, Redman, Lemon. 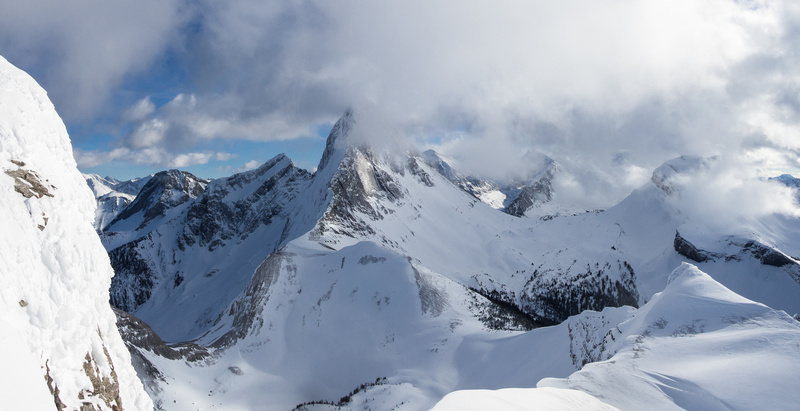 Mount Smuts and Birdwood from the summit. We came over the pass between them on lower center and right. 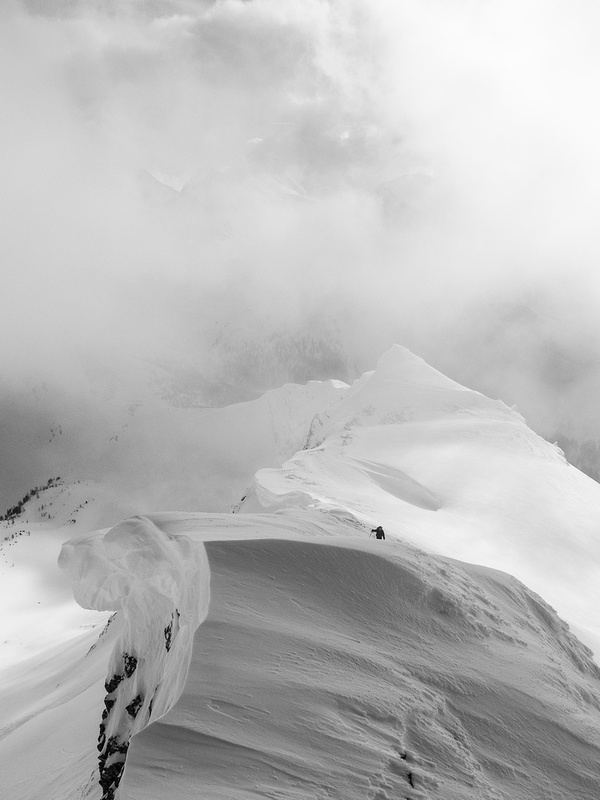 Descending the main summit ridge. 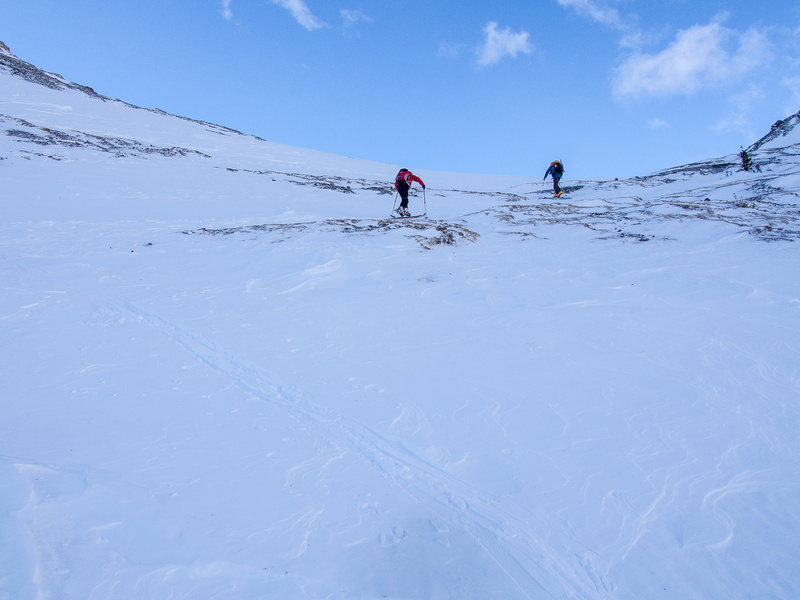 Wietse and Bill re-ascend the false summit on descent. In the center of the photo, Mounts Leman, Queen Elizabeth and Albert become more visible. Bill at the col between Birdwood and Smutwood. Skiing down to Smuts Valley from Smuts Pass wasn't the best skiing we've ever done. But it sure beat snow shoeing!!!! 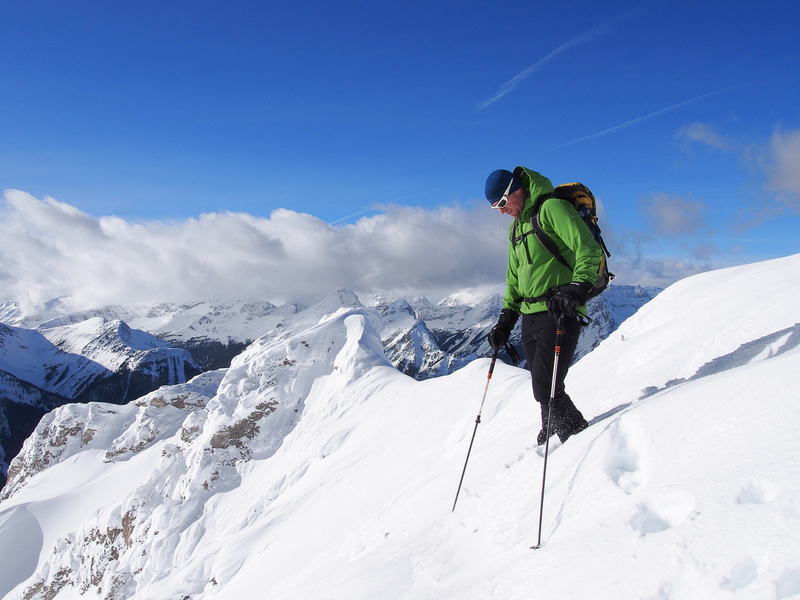 Bill skis down from Smuts Pass. Looking up at Pig's Back and the gully we descended a week ago!